It includes bell pepper, carrot, soy sauce, worcestershire sauce, ketchup, and sambal olek, which the recipe says is ground fresh chili paste. I used sriracha, which I think was close enough. At the end you mix pineapple juice and cornstarch and add that. It tasted quite good. 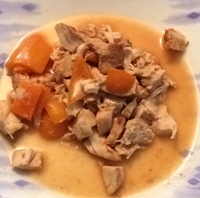 The dish had a sauce rather than a glaze (this is a slow cooker recipe, after all), but it was very close to what you would expect with sweet-and-sour chicken. The recipe said to sprinkle it with sesame seeds. I totally forgot that, but will make a point of doing so next time.